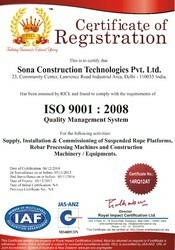 Incepted in the year 1985, Sona Construction Technologies Pvt. Ltd. is a distinguished organization engaged in manufacturing, exporting and wholesaling optimum quality Bar Cutting Machines, Bar Bending Machines and Suspended Platforms that are available in conventional and high frequency type. Our range finds extensive application in various industries such as construction, mining, electronics and others. All our undertakings are directed by our mentors Mr. Manish Sugandh, who has 20 years of vast industrial experience in the field that is very beneficial for developing market leading business strategies. We adhere to international standard to fabricate our assortment.Efficiently handled by our diligent team,we have state-of-the-art manufacturing and designing unit to create precision engineered range of vibrators. Owing to the technically advanced design, our range can withstand harsh conditions efficiently and effectively. Our company has canalized all its labors towards gratifying the variegated requirements of our clients in all aspects. For this, we offer the facility of customized solutions to improve the quality of our products and impart optimal value for money to our clients. 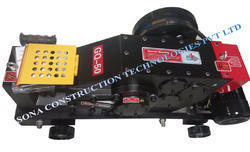 Manufacturing and Trading of Construction Machines. Considering the importance of a well built infrastructure, we have developed a sound manufacturing unit to undertake the manufacturing of High Quality Machinery. Our manufacturing unit is segregated into different sections that comprise fabrication shop, assembly shop, general machine shop and others. Streamlining our manufacturing unit has further helped us take on large scale consignments with efficiency and deliver them within the stipulated time frame. Our manufacturing plant is fully supported by our in-house unit that is used to verify our designs before implementing and manufacturing them. Together, our manufacturing facilities and our professionals ensure that our products are in confirmation to international standards. We offer wide assortment of Rebar Machines that are renowned for their quality, longer service life and efficient performance. These attributes make them utilizable for various purposes all over. The workforce is an inseparable and integrated part of any organization. We have a diligent and talented team of experts and professionals from different fields. All the members of our workforce work in perfect coordination to enable uninterrupted business and production procedures. All our personnel have thorough knowledge and experience in their related field and can efficiently handle all situations. Their efforts and sincere dedication towards their work have taken our company to newer heights, over the years. Our exporting countries are South Africa, Bangladesh, Nepal, Shri Lanka.